Congratulations on successfully completing the Grade 8 Entry-Level Referee Course! I am your State Director of Instruction (SDI) for Iowa. You can call, text, or e-Mail me anytime with questions that you may have. Please add me, RCWalaskaSDI@gmail.com, to your Address Book so that my e-Mails don't end up in your SPAM folder. You should bookmark this Iowa Soccer website. Through these pages accessed via the REFEREES tab, the Iowa Referee Committee (IRC) can be your virtual mentors providing you with resources and answers to FAQs to help you as a referee. Also, the Iowa Referee Committee (IRC) has a Facebook Page. Please 'Like' us. If you are not contacted by an Assignor to work games, consult the Assignment page for a list of Assignors. You can also e-Mail the State Director of Assignment, Lou Agocs, at misoa.soccer@gmail.com. Be sure to checkout Official Sports International (OSI) for Referee Starter Kits. OSI is the official supplier of referee uniforms for US Soccer. You can purchase a very reasonably priced new referee starter kit from them so you'll be ready to referee. I recommend getting the yellow shirt. US Soccer will assign you a 16-digit USSF ID Number 30-45 days after course completion. Instructions for how to download your Registration Card with your USSF ID Number printed on it can be found at "How to Print Your Registration Card" under Publications. You don't need your Registration Card to referee but you will need your USSF ID Number to register next year. IMPORTANT: Having completed the course, you are registered with US Soccer as a referee for the rest of 2018 and all of 2019. You will have to register for 2020 between August 1 and November 1 of 2019. Registration is required annually. I'll e-Mail you re-registration instructions in the Summer. Make sure you understand what the referee wants you to do in managing substitutions, how long to hold the offside signal, etc. Hold the flag in the proper hand. Referees usually run a left diagonal, which means the flag will be in your left hand most of the time. If you turn sideways to walk up or down the field, switch hands with the flag as necessary so the flag is field side and the referee can see the flag clearly. The flag should always be switched hand to hand in front of you, below your waist, and not above your head. Make eye contact with the referee as often as possible throughout the game when you are not watching for offside or attending to other AR duties. Stay even with the second-to-last defender. (The goalkeeper is usually the last defender, but not always.) This positions you to make accurate offside decisions. Follow the ball all the way to the goal line so you'll be in position to see if the ball completely crosses the goal line. Following the ball to the goal line each time is an excellent habit to get into. When you're running a line, side-step so you stay square to the field as much as possible. This position allows you to continue to see the field and players. When you need to sprint to the goal line to follow play or the ball, then run in a normal sprint, while watching the field. Run to the corner flag, or close to it, when signaling for a goal kick or corner kick. Raising your flag yards away from the corner flag or goal line not only calls attention to the fact that you not in the correct position to make that decision, but also carries with it the idea that you are either lazy, or you don't care enough about the game to be in the proper position to make the call. When signaling for a ball that is clearly off the field across the touchline, point your flag in the direction the throw-in will be taken (not straight up). This is very helpful for the referee in making a decision on which team last touched the ball and which team should be awarded the throw-in. Assist the referee in making sure the throw-in is being taken from the correct spot by pointing with your free hand to where the player should be standing when taking the throw-in. Be proactive, don't wait for the player to make a mistake, help them get it right. You will probably do more games as an AR at first, but when you are assigned as a referee, remember to conduct a pre-game with your ARs. Tell them what you would like them to do in various situations, such as throw-ins, free kicks, goal kicks, etc. and make sure they understand what you are asking from them. Review offside and make sure the ARs have a clear understanding of the Rules of Competition for the league in which you are working. Be aware of your position on the field. It's tough enough to properly call a soccer match when you are on top of the play. It's impossible to make correct decisions when you stay close to or within the center circle. Even when officiating at the small-sided game level, get in the habit of being in the proper position and working hard. Always think about your positioning - you should know why you are where you are. What do you gain by being in this position? Maintain good eye contact with your ARs throughout the game. A good habit to get into is to make eye contact with your ARs on every dead ball situation. If you are working a game alone, remember to appoint club linesmen to help you out with balls in and out of bounds. Club linesmen cannot call offside or fouls, so this means you have to work extra hard in the middle and concentrate to make sure you are covering offside on both sides of the field. Ask for a club linesman from each of the teams, rather than two from the same team. Tell them to only indicate when the ball has completely crossed over the touchline or goal line, and not the direction the throw or whether it is a goal kick or corner kick. That is your decision. Remember that ball in and out of play is the only thing they can call as club linesmen. Make your hand signals clear; point the direction with a straight arm. Blow clear and sharp whistles. Learn how to make your whistle "talk" for you. Use the whistle to communicate control. Too many newly certified referees make a call with barely an audible "tweet" which tells everyone on the field that you are unsure of yourself. On your first call, give the whistle a firm blast and confidently point in the direction of the play. A firm whistle will eliminate 50 percent of the arguments. Vary the strength of your whistle depending on the infraction. For a serious foul, blow the whistle very loudly. Be decisive in your calls. Players and coaches may try to take advantage of the situation if you seem unsure. Run the diagonal system of control when you have ARs assigned with you. The most accepted diagonal system is from the right corner to the left corner – referees refer to this as a "left diagonal". At half time and after the game, review all the results (number of cards, scores for each team and any incident that occurred, as well as the information required to be reported by that particular league) so your game report is accurate. The full 228 page International Football Association Board (IFAB) Laws of the Game (LOTG) is available for download under Publications. 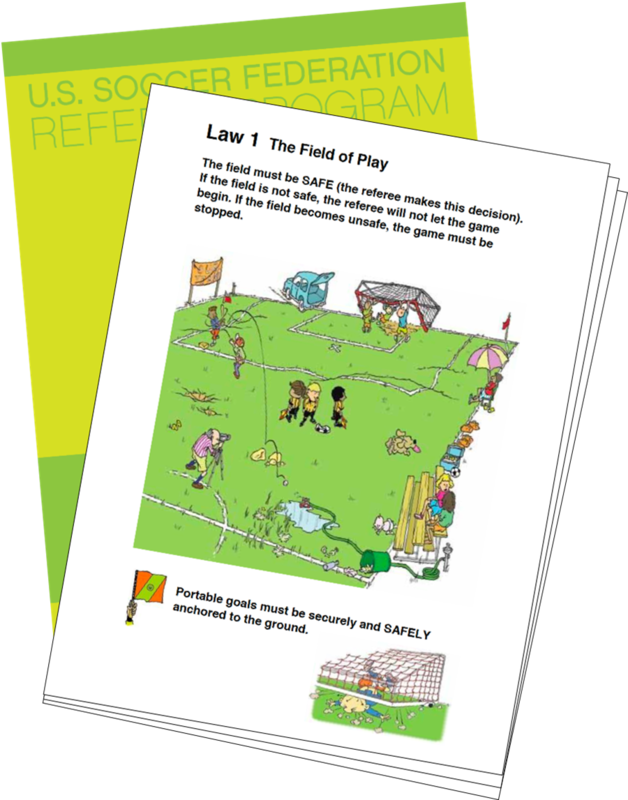 The Laws of the Game Made Easy is a simplified version of the LOTG (at only 55 pages) and includes the small-sided rules modifications – courtesy of our Region 2 referee friends at Ohio-South.